The Tribunal lost all respect when a County Court Judge sentenced Judd to 4 weeks for simply holding an arm. What is a County Court Judge doing on the panel anyway? Where was an expert like Colonel Sanders? Instead Leigh Adams should've been taking the stand for a disgraceful act of staging. Pretending his shoulder had been ripped from its socket by Judd's gentle arm hold. On to the highlights reel before I puke. And remember, Demetriou is to blame. After 11 rounds holding the number one spot on the Tipping Ladder, Longee comes under real fire this week. After seemingly breaking away with a 2 point lead, he's now level with Griggsy with only a small 29 point margin advantage. Griggsy is perfectly positioned in a carbon copy of his tipping last year when he drafted behind powerful and made his move on Grand Final day to take the cup. Elmo sits 3rd only one point off the pace, followed by Uglybustard, powerful and Craig Nettlebeck just 4 points behind Longee. With this week's round full of 50/50 matches, the ladder could look distinctly different this time next week. The atmosphere is electric in the Margin Comp as David Feck'Em finally succumbs to the presha of leading, being overtaken by Rod Carter and Uglybustard who jointly share 1st place, the second time this has happened after David Feck'Em and Longee joint-led in round 8. There is only 9 points separating the top 3, with Pete Connor climbing into contention only 27 points off the lead, and Arnold Layne the big mover from 11th to 5th, 34 points off top spot. No jackpot in Round 16 week thanks to Karmichael Hunt's post-siren goal to down the Tigers. $15 up for grabs in Round 17. Uglybustard continues to lead the Trivia Comp even with lowly average scores of 6 and 7 out of 10. Rotten Ronnie Andrews and gonadbreath hold the minor placings. Griggsy is still 4th but could even be a chance to take the comp out if he scores a few 10s. God help Elle. Spot prize* #5 giveaway for 2012 is a $50 double pass to The Laugh Garage in Sydney's CBD, corner of Park and Elizabeth Streets. The alternative prize for those not in Sydney is the you-beaut Uglybustards Executive Pen. The pen you use when you need to impress signing those big contracts. How many weeks did Judd get? 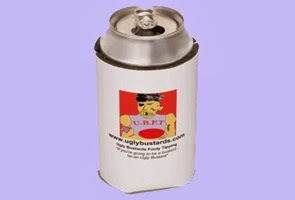 The first correct email received in the official Uglybustards inbox will be the winner. The Winner will be published in next week's Uglybustards Update. I never get tired of watching those last two Gold Coast goals. Only Richmond could lose like that.